Straight Outta Compton is now showing in cinemas everywhere and is distributed in Australia by Universal Pictures. The highly anticipated Straight Outta Compton is an extremely detailed look at the story and legacy behind U.S. rap band, N.W.A. who were active in the late 1980's and early 1990's. 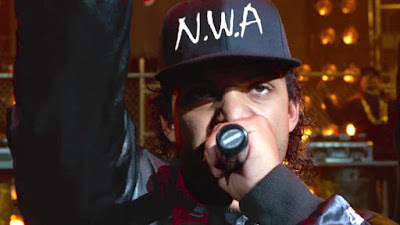 It is a piece of cinema which will be moving for those who were admirers of the band and it's music and while not quite as moving for those who aren't familiar with N.W.A, still incredibly informative, entertaining and enjoyable. Formed on the mean streets of L.A.'s Compton in the 80's when racial tensions were running high, N.W.A. 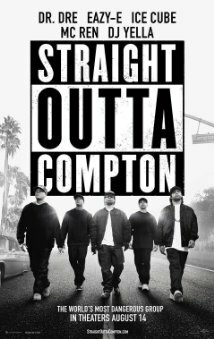 consisted of neighbourhood boys Eazy-E (Jason Mitchell), Ice Cube (O'Shea Jackson Jr.), Dr Dre (Corey Hawkins), MC Ren (Aldis Hodge) and DJ Yella (Neil Brown Jr.). Although criticised for it's violent content and explicit language, the band's music represented their reality and the inequality they felt growing up. Becoming wildly popular across the country, the band was never short of drama wherever they went with their wild lifestyle and music often inciting violence at their concerts, but behind the scenes was just as tense and unpredictable. Straight Outta Compton is an ambitious, but ultimately successful film. The story of N.W.A . and individual band members is not a simple one to tell and is many faceted. The film is not just a straightforward history of the band which is the pitfall of many biopics, but it also tells the cultural significance of N.W.A. and their music. For those who are not familiar with the gangster rap genre which the band revolutionized, Straight Outta Compton makes one come to an understanding about the music and realise that the explicit content is not for the sake of shock, but an response fuelled by anger to the events they played witness to and involuntarily had been a part of. The film also demonstrates how and why the band's music was and still is important to so many people and came to be a soundtrack to historic events such as the Los Angeles Riots in 1992. Even for those who were not a fan of the band or their genre, with Straight Outta Compton comes a new found respect for their music and message. There is so much content to fit in this story about N.W.A and it is an absolute credit to the screenwriters Andrea Berloff and Jonathan Herman that they were able to include as much as they could to give what is an almost complete story of the band including their cultural impact. However, as is the case with films that do have so much to say, a great deal of emotion and power is lost in certain areas. This is not a general observation as the film is indeed powerful in particular scenes, but some events are skimmed over rather quickly (such as the band's arrest in Detroit and Dr Dre's police chase) and the ensuing consequences not greatly explained. This was always going to be problematic as in order to tell a complete N.W.A story with so much included some things were going to have to be left behind. As is the case with a biopic who's subject or subject is still alive, there are also several truths eliminated from the band's history in order to protect the reputations of the remaining members. This could again be put down to trying to fit so much into the film, or the inevitable outcome of outcome of having Dr Dre, Ice Cube and Eazy-E's widow, Tomica Woods-Wright in producing roles which obviously comes with a certain degree of power. Telling the story of the band and the five band members (with the greatest focus on Eazy-E, Ice Cube and Dr, Dre) takes place over an eight year period from 1987-1995. The film channels this era very well and is rather nostalgic. The recreation of South Los Angeles in the late 1980's brings an atmosphere of peril and tension to the film in it's opening stages and the contrast between where the band comes from and where they arrive at are at opposite ends of the spectrum, yet the are both felt with a feeling of dread. It is particularly worth seeing Straight Outta Compton on the big screen for the optimal music experience. Not surprisingly one of the main features of the film is the music of N.W.A and the band members as solo artists. The most entertaining musical scenes are absolutely the recreation of their live shows, which are rather enjoyable regardless if one is a fan of rap or not. Straight Outta Compton boasts some wonderful acting performances, particularly those of the film's three main stars. Jason Mitchell portrays Eazy-E with an incredible presence and wonderful strength, which is evident in his very first scene and does not falter throughout the film. Corey Hawkins is very good as Dr Dre and perhaps gives the most emotional performance. Much of the film's media attention has been drawn towards O'Shea Jackson Jr. who is playing his real life father, O'Shea Jackson AKA Ice Cube. One does wonder whether his performance is a drawn out imitation of his father, but regardless he is extremely powerful in his delivery of dialogue and has a great deal of on screen presence. Paul Giamatti also does well as the band's manager, Jerry Heller and special mention must be given to Marcc Rose, who although is only on screen or a very short amount of time as Tupac Shakur makes an incredible impact for his uncanny likeness to the late singer. Straight Outta Compton is one of the more successful music biopics to have been released in recent years. For an outsider learning about the band and it's history for the first time, it may not pack the emotional punch felt by those who are N.W.A. fans due to the overwhelming amount of content included. Yet, it is still a great accomplishment to have such a detailed screenplay and extremely entertaining to play witness to.